It’s essential for locums to have an appropriately stocked doctors bag. This enables you to work safely, and with confidence that you are not reliant on whether or not equipment or drugs are available at the surgery. The bag should be lockable. Most medicines should be stored between 4 and 25C, so bear that in mind when storing your bag- probably better to be stored in your home or at the surgery rather than in a car of varying temperature. If you do need to store it in your car, lock the bag out of sight in your boot. Check your drug expiry dates every few months. BNF – available as a smart phone application or LO can help with getting a paper copy. Desk aids ( eg peak flow charts, Snellen charts) Most aids are available on smart phone apps. The bookmarks section on LO can be used to store any web based tools you might use. It’s mobile friendly. Any equipment that requires recalibrating will need this done annually. Most practices won’t mind you adding a couple of extra bits of equipment to their list to be done alongside theirs- it’s really worth asking. Photo card ID – As a locum, on visits you may need to confirm your identity. Consider a personal alarm – several versions are available. Don’t be without sat nav! It will get you to a new practice and out to visits in unfamiliar areas as quickly and stress free as possible. When deciding what to carry in your bag, it’s worth considering what you feel confident using, the waiting time for a paramedic in the area and how far away the local hospital is. 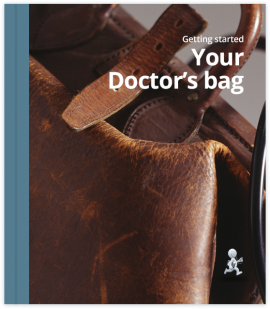 The Drugs and Therapeutics Bulletin have excellent papers on drugs for the doctor’s bag (2015) grouped by clinical scenario for both adults and children. Also, Patient.co.uk has a good section on drugs to carry as a GP. It’s a good idea to send written confirmation of all doses of drugs given by you with the patient if admitting them to hospital. A CD register of the stock held in your bag should be kept, ideally separately to your bag (in case of theft). This should be updated within 24 hrs of use of a CD. Restocking of the bag with CDs should be witnessed, as should the appropriate entries into the CD register. Your name, address and GMC number.